2 CT. T.W. Princess-Cut Composite Diamond Engagement Ring in 14K Gold Win her heart with this jaw-dropping 14K white gold engagement ring set with a generous 2 cts. of dazzling diamonds. This exceptional ring features a center composite of princess-cut diamonds in an invisible setting designed to look like one large stone. This ring's shank bordered top and bottom with round diamonds, while baguette-cut diamonds set in linear channels add depth and dimension. 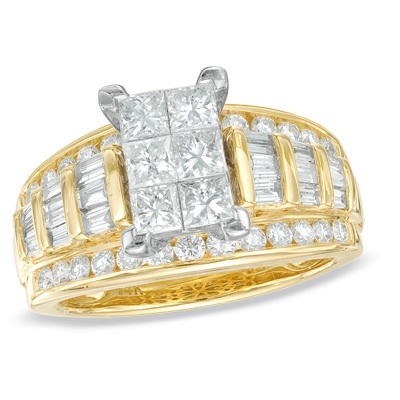 Buffed to a brilliant luster, this ring, and your heartfelt proposal, are certain to bring about an enthusiastic "Yes!" in response. PRODUCT SPECIFICATIONS Stone Type	Diamond Stone Shape	Princess Diamond Total Weight (CT. T.W.) 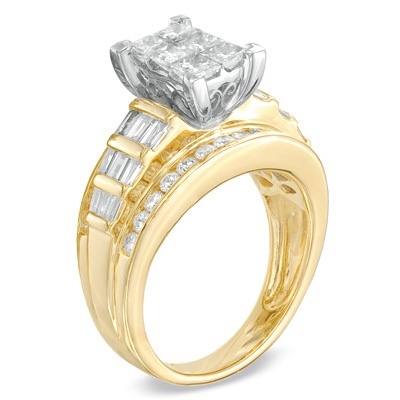 2 Diamond Color	H - I Diamond Clarity	I2 Stone Setting	Invisible Gold Karat	14K Standard Ring Size	7 Lifetime Diamond Commitment	Yes Metal Color	Yellow Metal Type	Gold Stone Color	White Diamond carat weights (CT.) represent the approximate total weight (T.W.) of all diamonds in each setting and may vary no more than .07 below the stated weight. Typographic errors are subject to correction. Merchandise enlarged to show detail and may not always be exactly as pictured. Promotions, prices, styles and availability may vary by store and online.